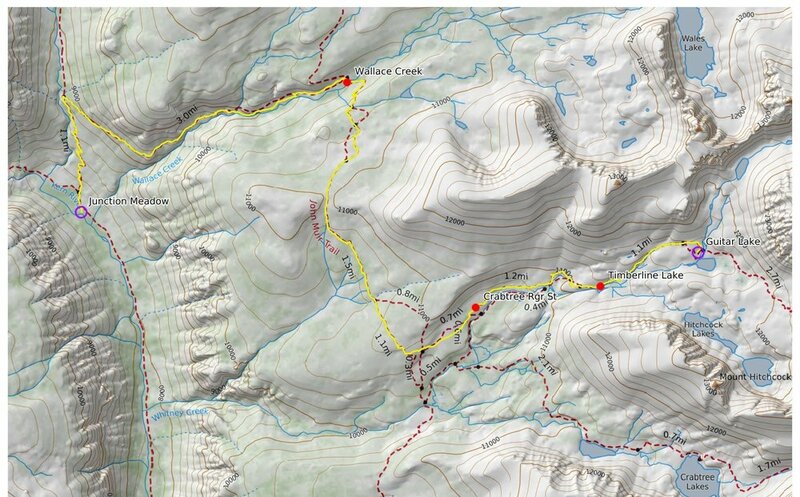 Our fifth day on the High Sierra Trail was the day with the most total elevation gained. The day was mostly spent climbing uphill nonstop gaining 4,357 ft in just under 12 miles. The best views of the day were during the climb out of Kern Valley, especially with the dramatic weather in the morning from the sun, rain, hail, and snow. And we finally got a taste of what summiting Mt. Whitney would be like during the final climb up to Guitar Lake, our final campsite. We woke up to light rain on the tent and low clouds shrouding the mountains surrounding Junction Meadow, which made packing up a lot of wet gear somewhat challenging! Back on the trail, we continued along the valley until we reached the junction for Colby Pass about 0.2 miles from our campsite. The trail started climbing and switchbacking up the mountain, all while still following the Kern River, which was now flowing swiftly down a ravine below. The low-lying clouds transformed the valley into a moody landscape as we gained more elevation and climbed up towards the clouds. These views of Junction Meadow and Kern Valley below us were my favorite views of the day. Believe it or not, this was my first time actually backpacking in the rain! 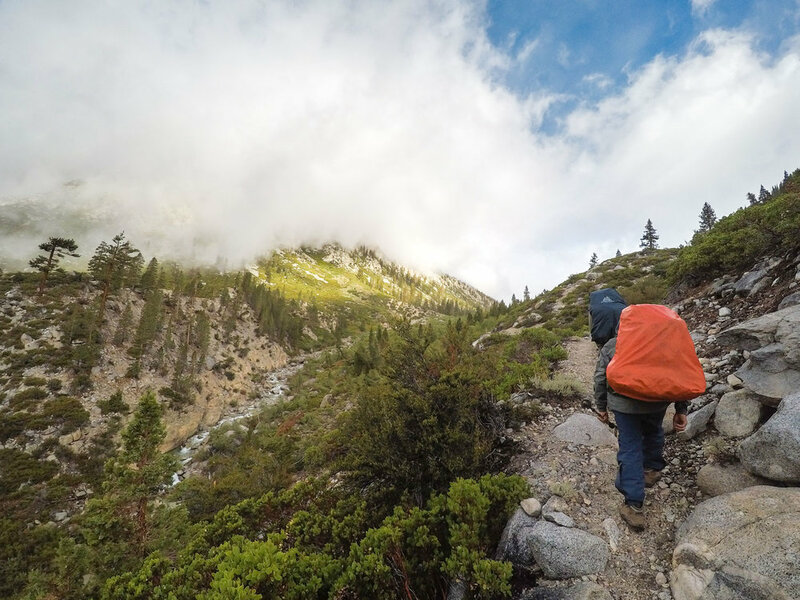 During our climb up from Kern Valley, the temperature dropped, and we soon found hail pebbles bouncing off our packs. One mile later, we turned sharply to the right and traversed along the side of the rim, heading into another side valley. This time we hiked along the north side of Wallace Creek, which also eventually flows directly into the Kern River. After another 2.1 miles, we crossed Wright Creek, and then Wallace Creek 1.25 miles later. These are both challenging crossings, but we managed with no hiccups this late in the season. While taking a break and looking at the mountains in the distance, I found myself thinking about how far we've come this week. Only a couple days ago we were on the other side of the tall peaks in the distance, which were now covered in snow. I'm always amazed by how far our legs and a little mental grit can take us. Almost to the top! The Kaweah Peaks in the distance are clearly visible from up here at 10k feet. As the sun started to come out, we merged with the John Muir Trail at last! 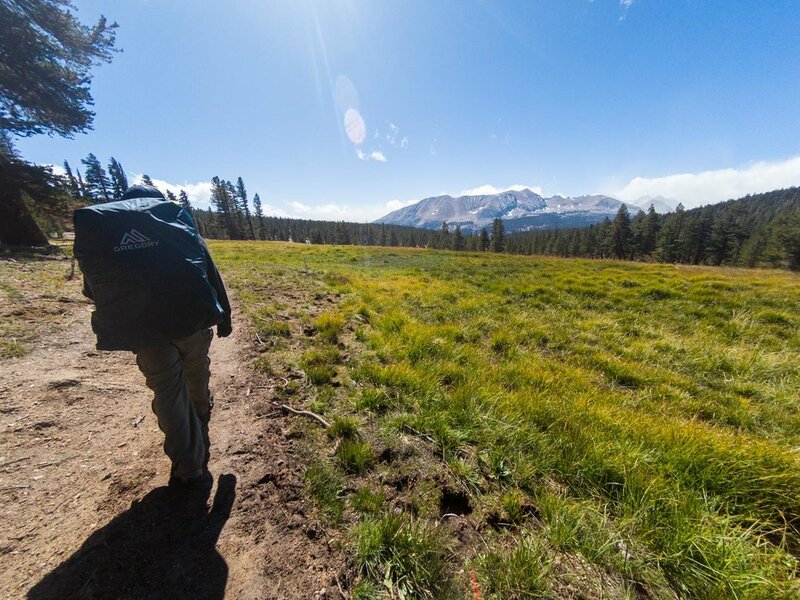 The remainder of our hike will now be the same final miles as famous 211 mile John Muir Trail. The trail was now relatively flat as it passed through some desolate forest terrain, and some areas had a thin dusting of snow from the morning's rain. Click here for my favorite backpacking meal ideas! There were plenty of camping options along this portion, since we were now sharing the trail with JMT hikers. This is also your last chance to use the trowel since from Crabtree on, you'll need to use a WAG bag until you hike out. 9 miles from Junction Meadow, we reached the Crabtree ranger station junction. We were initially planning on spending the night at Crabtree Meadow, but we decided to shorten our trip by yet another day and push another 2.7 miles to Guitar Lake to hike out the next day. We passed some backpackers at the junction who told us that a ranger said summiting Mt. Whitney should be possible the next day, even after today's weather. They also mentioned that tonight would be the coldest night, and Guitar Lake was our highest elevation camping site of the entire trip. I think our whole group was ready for a shower and bed, so we decided to brave the cold night and head up to Guitar Lake to prepare for the hike out the next day. As we started the climb up along Whitney Creek, it started snowing hard on us. What a day - sun, rain, hail, and snow all in one day! We soon had snow flurries all around us shrouding out any views of the meadows below us. The snow slowly faded and moved on. At mile 10.5, we reached Timberline Lake, an idyllic lake up at 11,100 ft. with clear water and lots of vegetation. Since this lake probably sees a lot of traffic from Mt. Whitney hikers, camping is prohibited here. We only had 1.1 miles to go, and the landscape was starting to change dramatically as we climbed above the tree line and our surroundings became completely rocky terrain. 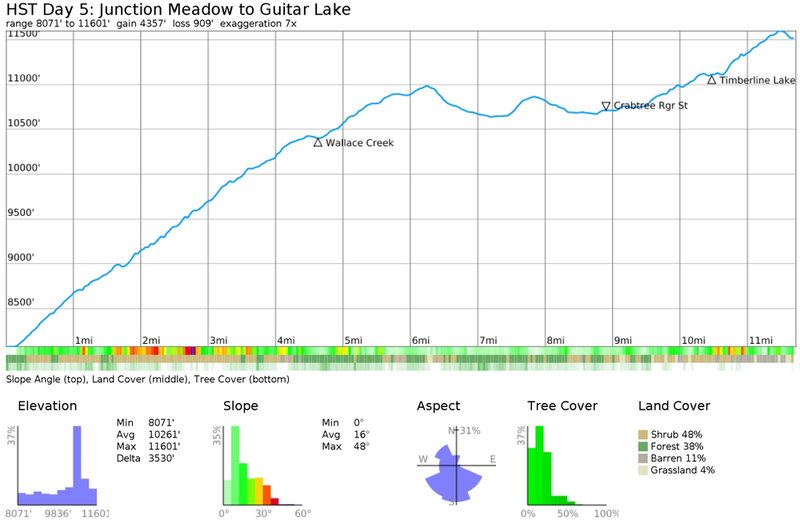 When we finally got to Guitar Lake, we were all feeling the elevation (and the cold!) at almost 11,500 feet. There were only three other tents set up on the opposite side of the lake, but I can see this lake being incredibly crowded during peak backpacking season - most of the areas around the lake have been turned into a sort of mini basecamp with every flat dirt spot turned into a camp site, and sadly we spotted trash that people have left behind. As the sun started to set, the icy wind whipping through the granite bowl was so numbing that we couldn't do dishes because the water would freeze instantly and cover our bowls and cups with a layer of ice. Looking back, we can now laugh at how ridiculously cold it was up there. I remember everyone frantically running around scrambling to gather everything and trying to jump into our sleeping bags as quickly as possible since we could feel the temperature dropping by the second. What would follow would be the coldest night of my life. Our breath would condense on the tent roof, freeze, and then snow back down on us throughout the night, and all of our water froze completely solid! We had originally planned on getting an alpine start to catch the sunrise from the to of Mt. Whitney, but we quickly realized that was out of the question as we could barely be out of our sleeping bags without losing feeling in our toes and fingers! 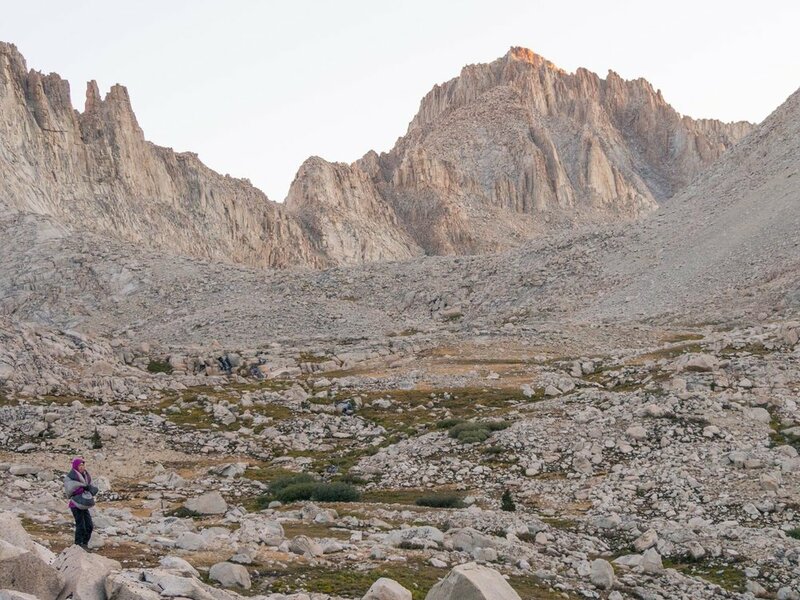 As our final night in a tent for the week, we all tried to get as much rest as possible in the cold and thin air to prepare to climb up to the tallest point in the contiguous United States the next morning.